Notice: Happy 2008! Notice: Happy Lunar New Year! 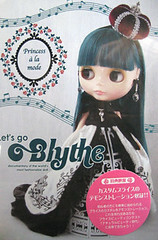 Notice: Let’s go Blythe Documentary DVD is out! If you couldn’t make it to the Blythe beauty contest of 2007 and wish to watch it in the comfort of your own home, here’s your chance! “Let’s go blythe” DVD can be purchased via Juniemoon online shopping or ebay :D And you will get to see Daisy and Clover being walked down the runway at Princess a la mode at Omotesando Hills, among the other wonderful winning custom dolls by people from all around the world! I am really trilled to get my copy and very happy to see the wonderful animation of Princess a la mode in it, I still remember watching it live at the contest and exhibition and couldn’t stop myself weeping as the story strongly tugged my heartstrings! The DVD includes a demo on how to custom blythe, within the rules for the next “Natural Beauty Contest”! It also feature the finalists of the Beauty contest interview, Princess a la mode Charity Fashion Show, Bahashishi special live performance and more! 2 Responses to Notice: Let’s go Blythe Documentary DVD is out! I don’t know much about Blythes but the one on photo above is the most beautiful doll I’ve ever seen and NOW I understand at last the epidemy of Blythe addiction.